RHONJ fans may remember that one “OG”, Caroline Manzo, predicted that Teresa would one day write a memoir. Check! And that Joe would go to prison, and then Teresa would dump divorce him. So much for those old-school values, Teresa! 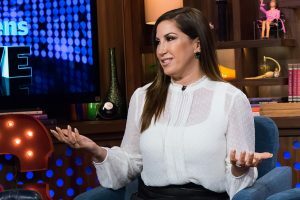 Page Six is reporting Jacqueline Laurita and Caroline are weighing in about who really rules New Jersey. A teaser on Instagram for Caroline’s son Albie Manzo’s, podcast, “Dear Albie,” featured Jacqueline’s comments about Caroline’s possible return. “They need you back! That would be epic,” Jacqueline said. But you just know that RHONJ alum Jacqueline couldn’t stop there. Caroline revealed during the podcast that Bravo offered her a spot as a Friend of the Housewives for Season 10. Caroline seems to be open to a possible return, but she wants Bravo to show her the money—literally. Hopefully, all the tables in Teresa’s home have been bolted down, If Caroline or Jacqueline ever return to RHONJ, it is going to be table-flipping insane! TELL US: WHO DO YOU THINK THE QUEEN OF RHONJ IS? WOULD YOU LIKE TO SEE CAROLINE OR JACQUELINE COME BACK?